It’s always nice to get out of your own neighborhood to explore. I met my cousins Cat, Gillian and Morgan at Distilled for a pre-dinner drink the night before the Brooklyn Half Marathon. Winter seems to have finally left, so we sat outside and took in the sights and sounds of Tribeca. Off in the distance I see someone familiar… it’s my friend Maria leaving work! She comes up and high fives me and we got to catch up for a hot second. Our dinner was across the Street at Terre, a chill Italian spot. The food was really top notch! I had the Rigatoni (Danza) e Gamberi (spicy grilled shrimp, garlic and tomato) and I have been dreaming about it ever since. No visit to Tribeca is complete without a drink at Nancy Whiskey Pub so we popped in for one. I randomly woke up at 4:45 and since I was planning on waking at 5 I just stayed up. I prepped some Cafe Bustelo in a go cup, geared up and then called my friend Trevor like 2 or 3 times to wake him up. We were traveling to the start together and he warned me that he might sleep through his alarm. I donned my poncho and headed out into the rain. It was 5:20AM. We opted for a cab as we were running slightly off schedule. We arrived at the entrance to Wave 1 security right around 6. 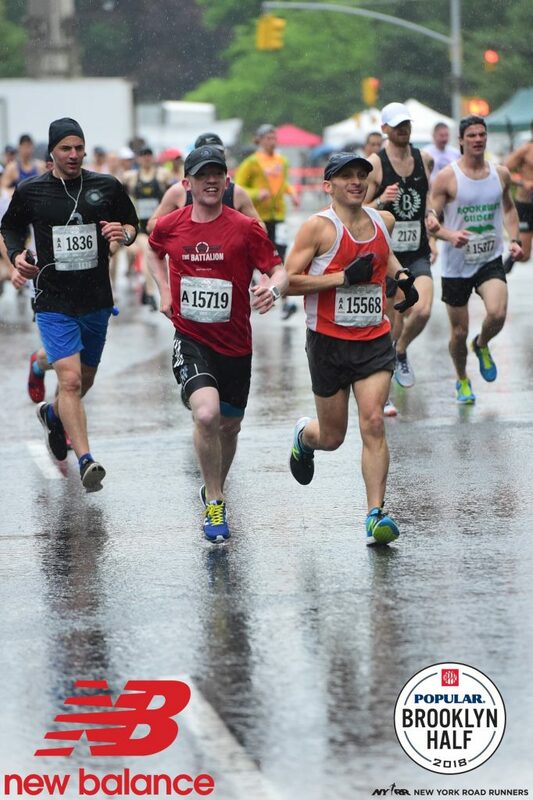 It was steadily raining and 50 degrees, but I felt great. We met two of Trevor’s friends up by our corrals and hung around until it was showtime. I also saw my friend Sebastien who was warming up, so I jumped in and did some easy running. Then, right before we were to enter the corrals I saw Evan and he gave me a bear hug. He said he was shooting for a 1:15. Spoiler alert, he ran a freaking 1:13 which is a monster PR and generally speaking just a great time! 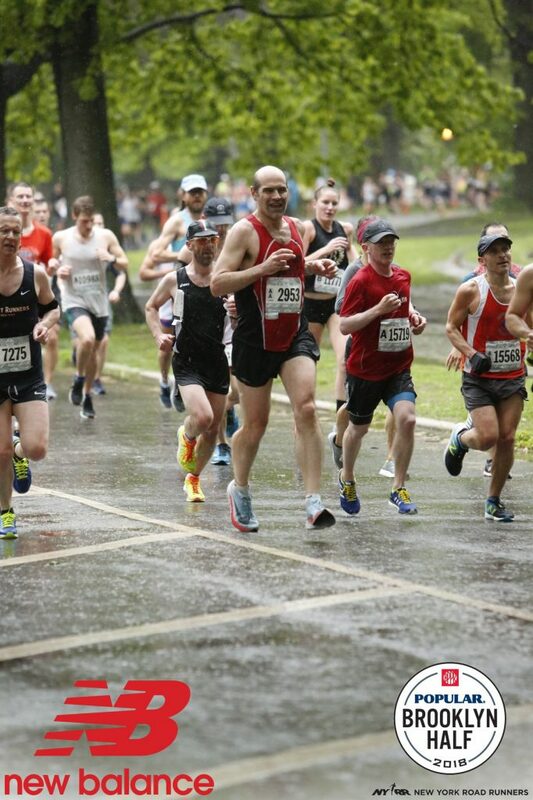 As we waited in the corrals a few of us that ran Boston were chuckling how these conditions pale in comparison. 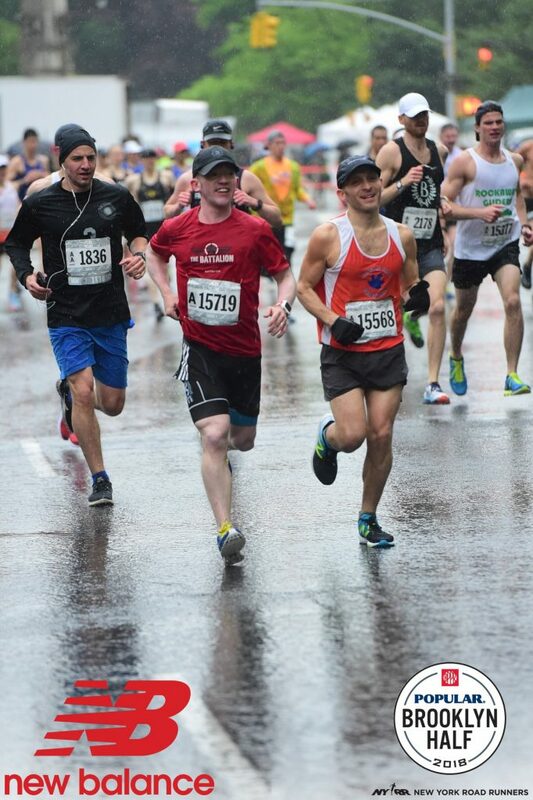 I was thrilled to be running in a warm spring rain! I also remember being very very calm right before the start, while others hopped around shivering. Was this running nirvana? Runirvana? The gun sounded and we were off to a pretty quick pace immediately, maybe 6:30ish. Half of a mile in a guy next to me says ‘Hey Baker, how are you?’ It was my friend Brad, a CPTC runner who I have done marathon training runs in Central Park with! We started running together chit chatting. A mutual friend and runner he coaches Patrick was up on the left and shouted a hello. He was aiming for a faster time then Brad and I so we let him slip away. We were pretty soaked by now, but it wasn’t too debilitating. In fact, I felt perfectly cooled as far as my core temperature was concerned. 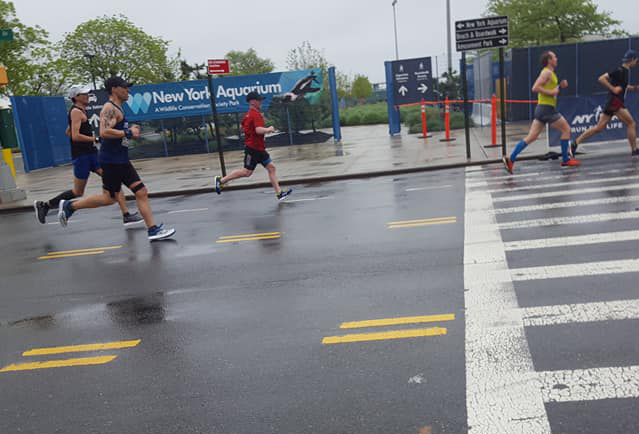 Brad and I were on the same page with tempo, we were going to hold down a 6:30 pace until we hit Ocean Parkway at mile 7 and then open it up if we felt good. At aid stations we were working together as well with only one of us going in for fuel and passing it off to the other. It’s a great teamwork strategy where you hardly slow down and can keep the focus on the pace. I felt good, but I definitely didn’t feel fast or fluid. We were still having fun as we entered Prospect Park and our pace was on track. I am happy to report that even on Prospect’s rough hill at mile 5 we held a 6:33 pace, pushing each other up the hill. It was right around here, as we crested that I heard a runner say, “Hey Baker!” It was Trevor! We rocked a 6:05 on Mile 7 as we were descending out of the park and onto Ocean Parkway. I was also frustrated as my shorts kept falling down due my drawstring not being tight. They were also water logged which wasn’t helping. I made the decision to say goodbye to Brad soon after to tie them as I couldn’t go another 6 miles like that. I pulled over and tied them super tight, there was no way I was pulling over again. Having lost 10-15 seconds, I took off again and got my pace back up. 2 minutes later my left shoe came untied! So Mile 8 was a 6:51. Soon I passed Trevor again who seemed quite confused to see me behind him. Miles 9-11 were pretty uneventful as I tried to maintain my slowing pace. I was now in the 6:40/45 range and my right hamstring was hurting. All of us were now doing a bit of leapfrogging as we were nearing the end. At Mile 12 I saw my friend D (Delgado) cheering! I finished with a 1:26:45, not by best and not my worst. After walking through the finish I beelined it over to baggage. The Brooklyn Half Marathon is notorious for bad bag check retrieval and I was getting cold. It did in fact take a solid 15 minutes for me to get my stuff even though there were maybe 10 people waiting at that point. Next up, Ruby’s for our afterparty. Ruby’s was actually moderately full with non-runners as I entered. I luckily found a table and posted up. Soon after D showed up and gave me a high five and hug. His friend Rashid from Cali was there with his girlfriend so we joined them. Rashid finished in like 1:17 or something sick! We also learned that Rashid and I both ran Paris the same year, him finishing in a 2:50 and me a 2:51! We HAD to have been running next to each other. Trevor showed up next followed by Bojana, Sweendawg and Brian. Tommy, Kelly and Fiona popped by for a little while too. Big ups to Tommy who rocked a 1:36 which is a solid 3 minute PR! Finally, Maura, Kate and some of the Gotham City Runners showed up to join us. It was great to see all my people out there. 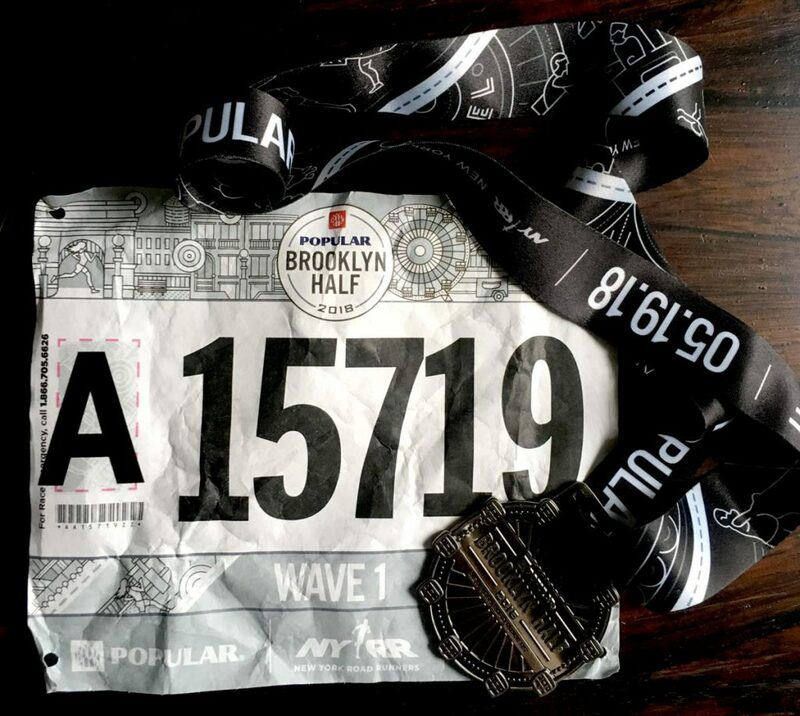 That’s one of the reasons I love the Brooklyn Half Marathon so much… and the afterparty is wild and stinky.